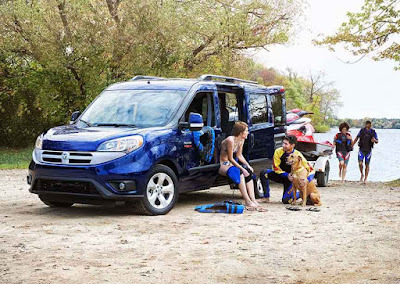 The 2016 Ram ProMaster City Wagon and Wagon SLT offer fantastic versatility, making them an ideal vehicle for a wide range of people in New Mexico. A small-business owner can mix work and play in one vehicle. With car-like comfort and 5-passenger seating, the ProMaster City Wagon is family friendly. With all five seats in place, there’s still a generous 45.6 inches of cargo space available. Not using the back seats? There’s 68.7 inches of cargo space available with the seats folded and tumbled. Professional musicians, photographers, video production crews, and many more will find the versatility of multiple seating configurations and generous passenger and equipment space both convenient and invaluable. The bi-link rear coil suspension provides a smooth ride no matter if you’re taking the kids to the state fair or delivering custom furniture. Whether touring with the band or taking a family vacation, the 2.4L Tigershark MultiAir 2 engine with 9-speed automatic transmission provides 178 horsepower and 174 ft. lbs. of torque while delivering 29 MPG on the highway. The MPGs combined with the 16-gallon gas tank offer a 464-mile drive range, meaning fewer time-consuming fuel stops. Backed by a 5-Year/60,000-Mile Powertrain Limited Warranty and a 3-Year/36,000-Mile Basic Limited Warranty, versatility is matched by durability in the ProMaster City Wagon. Ruggedly built for the rigors of an industrial cargo van, you’ll get years of multi-use miles from this indispensable vehicle. Come in to Melloy Dodge today and take an up close and personal look at the incredible Ram ProMaster City Wagon.